Lauren completes the Basingstoke Half Marathon for Autism Hampshire! 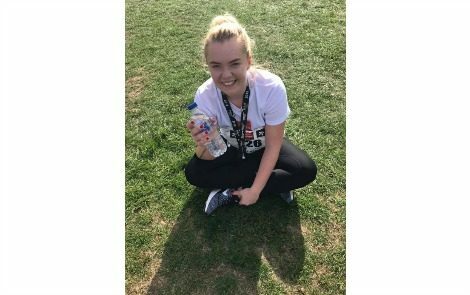 ‘It was by far the hardest thing I have ever done’ – Lauren was well and truly exhausted Sunday afternoon, however the generous sponsors she received towards Autism Hampshire were her motivation to finish the 13.1 mile Basingstoke Half Marathon, and we have to say, we are all extremely proud of her for completing the hilly challenge. For 2018, members of the Fresh and Clean team decided they wanted to raise money for Autism Hampshire, and earlier this year 5 other members of the team also completed a sponsored 13 mile walk for the cause. Laura H was also signed up to complete the Basingstoke Half Marathon, but unfortunately Laura encountered a hip injury as result of the training for the half marathon. Therefore, she had to make the decision to pull out of the event. However, she is keen to take on another challenge instead of the run and we will keep everyone posted with the details.